The delicate thin skin around the eyes is the first place that skin starts to age. Even the hair on our eyebrows and eyelashes reduce and become lighter over time, and if that isn’t enough many women find it difficult to apply eye makeup because vision can become worse with age. BOTOX® Cosmetic is a prescription medicine that is injected into muscles and used to improve the look of moderate to severe frown lines between the eyebrows (glabellar lines). 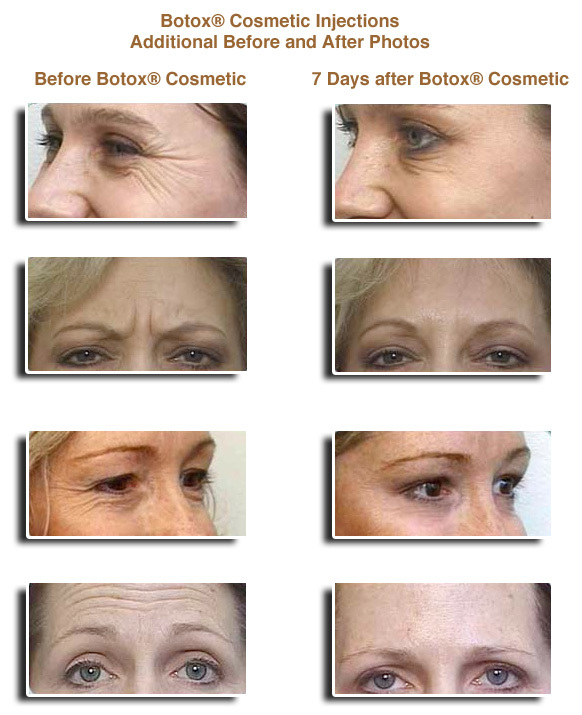 Botox will temporarily relax the muscles that create the lines around eyes known as crow’s feet. Botox is also used to treat the lines between the eyebrows, often refereed to as the elevens (11). Laser and chemical peels can be done to resurface the skin around the eyes and stimulate the fibroblast to produce collagen. Some laser treatments can be done around the eyes, as long as ocular shields are used to protect the eyes, however some patients are not comfortable with having the metal ocular shield placed inside their eyes. I personally prefer to do a chemical peel using a 30% – 35% TCA. I prefer the TCA because I am able to peel all the way to the lash line, I also feel that I am able to produce a better result with the TCA peel. If you are considering a TCA peel, be sure to go to someone with a lot of experience, especially if you have dark skin. It may be recommended that you precondition the skin with Tretinoin ( Retin-A) and Hydroquinone, before the peel. It takes about 7 – 9 days for the skin to complete the peeling phase, however this is dependent on the depth of the peel. In general you can expect the skin to start to darken up on the third day, you may see some peeling as soon as the fourth or fifth day. It is extremely important that you don’t “assist” the peel, treat the skin almost like you are trying to keep it on. Picking and peeling the skin off prematurely can lead to complication. Follow all post treatment instructions, which usually includes using a moisturizing product like Obagi’s Action. 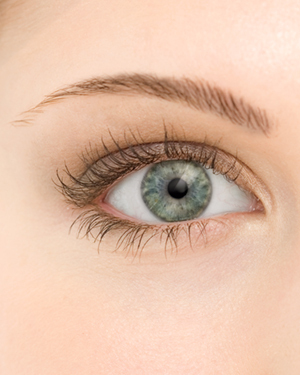 A plastic surgeon can easily remove fat pads from under the eyes. A Blephaplasty removes excess skin and fat. A transconjunctival blepharoplasty, is a procedure where the fat is removed from the lower eyelid, by making the incisions from the inside of the eyelid. The advantage is that there isn’t any visible scars, however it doesn’t remove excess skin from the lower lid. A plastic surgeon can also reposition fat, and reinforce muscles and tendons around the eyes. The surgeon may recommend a canthoplasty to reinforce lower eyelid support. In some cases a blephaplasty can be performed in the office with little to no down time. You should schedule a consultation with a plastic surgeon to see what procedure is best for you. You can have filler injected under the eyes to fill on the hollow area under the eyes. This is an advanced technique and should be performed be an injector that is very experienced at injecting fillers around the eyes. This patient has been bothered by the hollowing beneath her eyes that make her appear fatigued. The photograph shows the patient after injection of Restylane® to the right lower eyelid region, and before injection to the left side to simulate a before and after view. She was delighted with her immediate improvement at the end of the injection session. Photo courtesy of Shapiro Plastic Surgery. The browlift is a procedure designed to elevate the brow to a more youthful position relative to the eyelids. The endoscopic browlift is a minimally invasive procedure, which means there is very little bruising or swelling from the procedure. The procedure involves inconspicuous incisions made throughout the scalp, hidden in the hair meaning that the thin, few scars that are left behind, are hardly noticeable by even the patient themselves. The recovery time is very quick; surgical sutures are removed within ten days, after which most patients can comfortably socialize without pain. 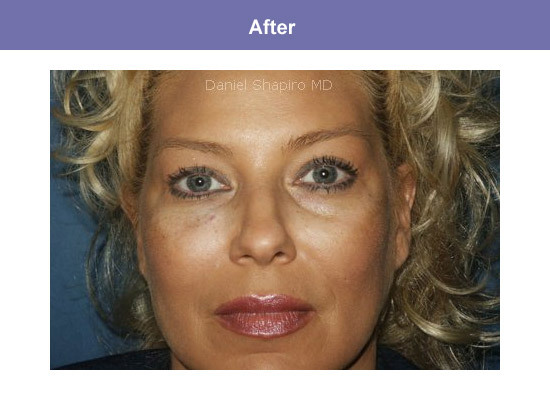 This is a very common procedure performed by, Paradise Valley Plastic Surgeon, Dr Daniel Shapiro. An open (coronal) browlift is a specialized procedure for patients with deep wrinkles or heavier skin. Deep wrinkles in the mid-forehead and between the eyebrows can be lifted out by using an open browlift technique. Both techniques are common procedures performed by, Paradise Valley Plastic Surgeon, Dr Daniel Shapiro. ReFirm and Thermage are skin tightening treatments that use Radio Frequency (RF) technology to gently tighten the skin. These treatments do not require any down time, however you may need a series of treatments for best results. I find that these treatments work best when combined with other treatments. Permanent cosmetic makeup is cosmetic tattooing elevated to the highest artistic level. Permanent make up can help give you back what time has taken away, and help to enhance your natural look. Permanent make up is not necessarily intended to replace cosmetics completely, because the color is placed “in” the skin and not on the skin, so a more natural, softer look results after the skin has healed. Permanent make up makes it possible to look better round the clock and be less self conscious. When you look better you feel better! It is a great time saver, perfect for active outdoor lifestyles, sensitive skin, and clients with contacts, glasses or difficulty applying make up. You may notice that your lashes and brows are not as full as they were when you were younger.Latisse is the first and only FDA approved prescription treatment for eyelash growth. It is an easy to use topical solution that you apply once a day at the base of your eyelashes. Lashes gradually start to get longer, thicker and darker. You will notice results in as little as 8 weeks, and full results in as little as 16 weeks. Keep in mind that hair growth can develop in other areas that the solution is applied to. I personally have used Latisse on my eyebrows and have seen an improvement. To enhance the look of your eyes, you can have your eyelashes and eyebrows tinted. The treatment is quick, painless and inexpensive. The results are temporary, and last about 4 weeks. Eyelash and eyebrow tinting is also great for men, because they generally don’t wear makeup. You may have already seen the Brook Shields commercial for Latisse, if you are not familiar with this product, let me just say ” it is a must have”. 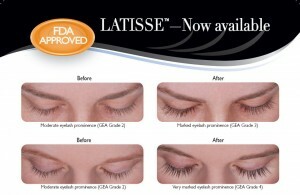 Latisse is the first and only FDA approved prescription treatment for eyelash growth. It is an easy to use topical solution that you apply once a day at the base of your eyelashes. Lashes gradually start to get longer, thicker and darker. You will notice results in as little as 8 weeks, and full results in as little as 16 weeks. Keep in mind that hair growth can develop in other areas that the solution is applied to. I personally have used Latisse on my eyebrows and have seen an improvement. The active ingredient in Latisse is (bimatoprost opthalmic solution) 0.03%. Bimatoprost is believed to work by keeping hair in the anagen (growth) phase. It first works by increasing the lenghth of the anagen phase, then by increasing the numbers of hairs that grow in this phase. Latisse is made by Allergan. In 2001 Allergan developed an eyedrop to lower pressure in the eye, to treat conditions such as glaucoma and ocular hypertension. Eyelash growth was a side effect of this drug, and Latisse was later developed as a result. 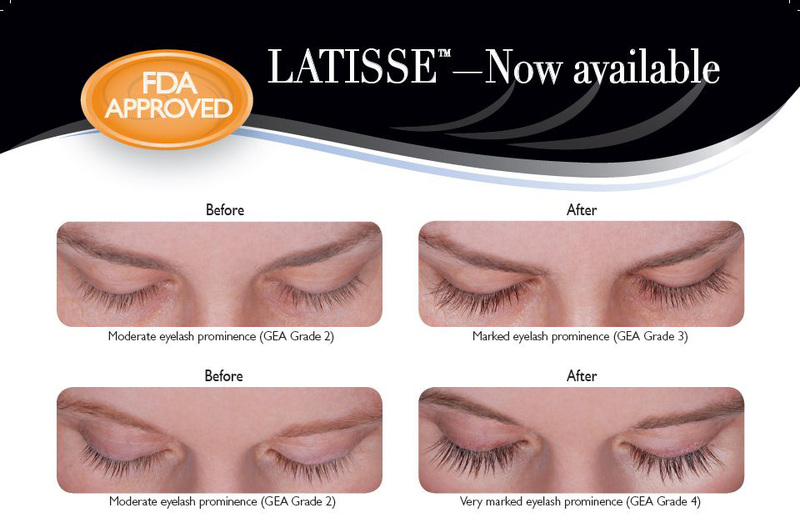 I am a big fan of Latisse, and all of my clients that have used this love it. Paradise Valley Skin Klinic also offers a wide variety professional skin treatments and products.